This isn’t the biggest piece of news, as we all expected it was going to happen, but, as they announced that they would earlier this month, Star Wars: Episode VII has officially resumed filming. Again, this isn’t a particularly stunning reveal, since, especially after the delay, they’re on an even more limited time table if they’re going to make the scheduled December 18, 2015 release, but for those of us who are excited about this movie (though we are, admittedly, wary as well), this isn’t the worst news we’ve ever heard. EW reports that the cameras have actually started rolling once again at the legendary Pinewood Studios in London. 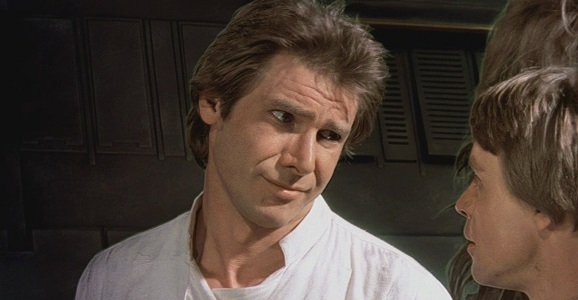 Production was forced to take a hiatus after star Harrison Ford, who you might remember played a little guy named Han Solo, broke his leg in an on-set accident and required surgery. After getting creative, shifting things around, and even spending a few days shooting on the picturesque island of Skellig Michael off the coast of Ireland, there was nothing else that they could do for the time being, and called a break. France is apparently dealing with an invading force of outside aggressors. 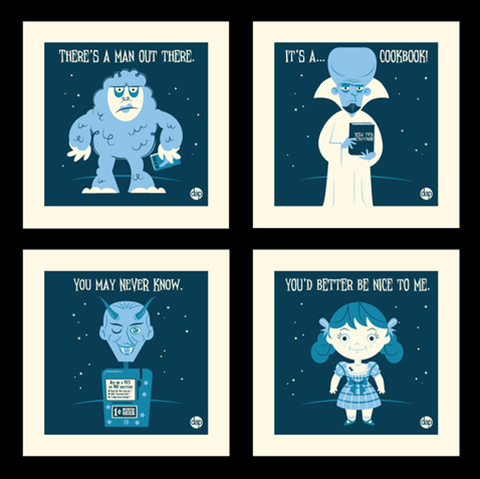 And this is one conflict that you’re definitely not going to hear about on your local nightly news (probably not anyway), because the enemy is, while a well known nefarious force of evil, also small, made of plastic, and entirely fictional. This invasion is comprised solely of Star Wars Lego pieces, but the pictures that document this incursion are nothing short of spectacular. 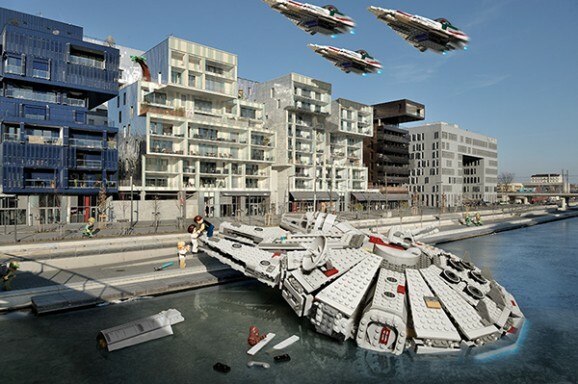 Photographer Benoit Lapray, working in conjunction with Lego France, is responsible for staging and delivering this fantastic set of pictures, which he has called “Toys Invasion.” The images show the Galactic Empire taking over an area in Lyon, France. And considering that the Imperial forces, like stormtroopers and Boba Fett are going on about their daily business like it ain’t no thing, you have to assume that their invasion has been a pretty damn successful endeavor thus far. The original Star Wars is filled with unforgettable scenes, but if you had to pick one that, purely from a visual standpoint, most captured the imagination of those of us who grew up enraptured by George Lucas’ galaxy far, far away, I think the Mos Eisley cantina sequence would have to be near the top of the list. It introduced Han Solo as an epic badass who shoots first (latter-day revisionism be damned), but it also gave us a sense of the sheer crazy diversity of Luke Skywalker’s universe, something we hadn’t much up to that point in the film. 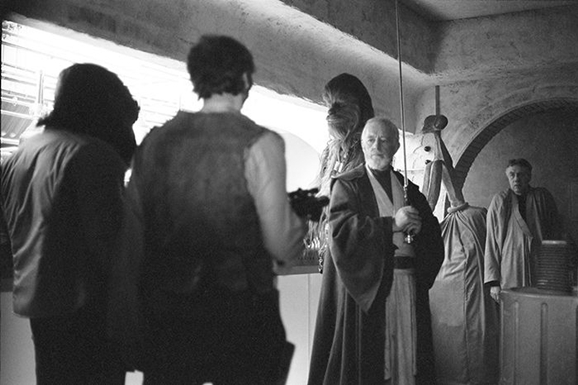 The inhabitants of that cantina made the Star Wars universe feel huge and strange and wonderfully real, and this amazing batch of behind-the-scenes photos give you a look at what went into populating that wretched hive of scum and villainy. If you’ve been anywhere near social media in the past few weeks, you’ve almost certainly seen at least one of the so-called “ice bucket challenge” videos. Give or take a thousand. The idea is that the challenged has 24 hours to either donate $100 to ALS research or to record and post video of them dumping a bucket of ice water over their head (and then still donating some smaller amount as well). We’ve seen damn near every celebrity and pseudo-celebrity on the planet participate at this point, so it was really just a matter of time before the challenge reached J.J. Abrams and the cast of Star Wars: Episode VII.